Many people use paver stones for their patio for specific reasons. One common reason is that stones are supposed to be more durable compared to wood or even poured concrete. Stones with the right texture could also deliver an elegant and rich look. Stone may also require little maintenance. Stones could even look better when it appears weathered, although we may need to clean it regularly to prevent the growth of moss or small weed. However, improper selections of paver stone could cause specific effects. Rain may wash away sand between the stones and weed could create gaps between stone blocks. Eventually, these small holes would allow ant colonies and other creatures to reside under the stone blocks. When it happens, it is time for us to maintain the paver stone. The surface should be sealed for added protection. We shouldn’t be reluctant to attempt this project on our own. First of all, we should take our time and consider every step that we should make. As an example, we may need to remove furniture and other objects from the patio. When cleaning the stone surface, we should use specific supplies and tools. As an example, acid can be quite effective in cleaning up our patio. Dry leaves that are soaked with rain water could leave brownish tannin stain on the surface. These stains can be handled quite effectively with acidic solutions. Before sealing the surface of our patio, we should really make sure that it is thoroughly cleaned. Algae, moss and mildew should be removed properly. These very tiny plants could cause discoloration and make the stone surface feels slippery when wet. Weeds could also burst their way through the joints. Foreign debris, such as pieces of wood, rubber and plastic should also be removed from these cracks, whenever possible. Power washer is a good tool to remove small debris out of the cracks. We should make sure that the washer has enough power to do the job properly. Anything under 2400 psi may not be sufficient to clean the stone surface and small cracks. 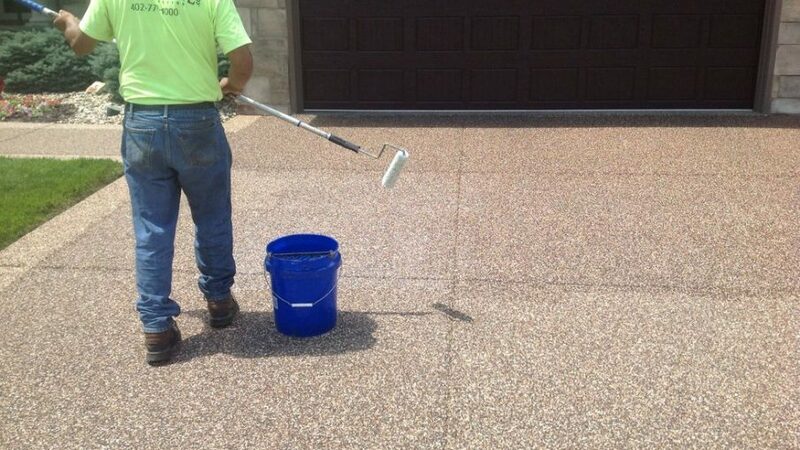 When the surface and cracks are properly cleaned, we can regrout the joints with fresh material. We could use fine grade sand and pour small amounts between the stones. Sweep the sand left to right and back to front, until we are sure that the joints completely filled. On larger cracks, we may need to pour more sands and try to compact the sand with small piece of wood to make sure that all empty spaces are filled. The next thing to do is to let the sand gets enough sunlight. We could also check the joints to make sure that there are no indentation. If we find one, we could refill it with sand. After the sand is stabilized, we could choose the proper sealer. Some water-based sealers could harden the sand and lock everything into place. For this reason, we should make sure that the weather is hot and sunny since we start filling the joints with sand.